The Orchid VoiceCrystal CP200 conference phone is PSTN and USB VOIP ready; allowing you to make quality conference calls using both your landline and VOIP service like Skype or MSN Messenger. The CP200 comes complete with two expandable microphones for added range. This also allows for more users. Hypercardioid directional microphone with automatic gain control allows users to speak with their own natural voice volume. Audible for rooms with a floor area of up to 60 square metres. With the Caller ID function, the number of all incoming calls are easily indentified. Hi-Fi audio amplifier and rare-earth Neodymium magnets adorn the speakers. Digital Signal Processing performs noise cancellation of >-60dB. Crystal clear simultaneous voice conversation may be performed. Bi-directional noise suppression purifies voice signal from both parties. 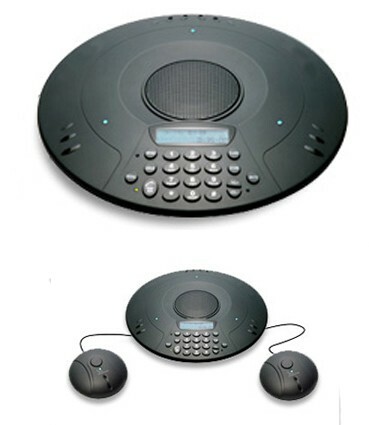 By attaching the unit to a Computer via USB port, you may use it for IP-based voice conference, or with Voice Chat software such as Microsoft Windows Live Messenger, Yahoo, Skype. 4 built-in microphones cover an effective area of up to 5 metres.